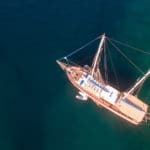 Whether you are pondering the thought of private gulet holidays in Turkey, in the process of booking one or already have, one of the first things to think about are flights. Each country offers convenient, and not-so-convenient flight plans to get to your preferred destination. The closer to peak season your travel dates are, the higher the costs may be to buy airfare to Turkey. Not all major global cities and airport offer direct flights to the smaller airports outside of Istanbul. 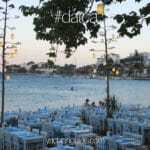 These airports namely are Dalaman and Milas; which serve the harbor cities of Fethiye, Gocek, Marmaris and Bodrum – where all gulet holidays in Turkey embark and disembark from. Sometimes the connections are available but the flight tickets are steep. An alternative route to take, in order to embark and disembark from the harbor – your chosen gulet is anchored could be to book your flights to and from Rhodes. The island of Rhodes is about 2 hours by ferry from Bodrum and 55 minutes by ferry to Marmaris; and visa versa. According to travelers, not only are the flights cheaper but also more frequent from cities in the USA and Europe. If finding affordable flights and reasonable times is an issue with your private gulet charter holiday, then why not look into the idea of checking flight schedules to and from Rhodes, Greece. 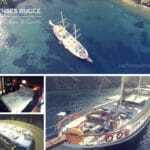 Sometimes, gulet cruises in Turkey can offer boats that may be able to embark from Rhodes, if the booking schedule permits. That way you may not have to even take a ferry from or to Rhodes after all. 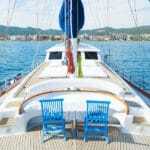 Inquiry with your yacht charter agent for possibilities.